Canvas and canvas panels are traditionally used for paintings and come in a variety of sizes and colors. They can be purchased at any art supply store or online if you know what sizes you need. However, art boards and Masonite boards are other materials that are relatively inexpensive and create a smoother look to your design. These types of boards can be found at hardware stores and cut to specific sizes. There are a wide variety of paints you can use. Oil paint is my go-to, and I like to use solvents to blend colors together. There are water-based options if you aren’t comfortable using the solvents. Acrylic is water-based and can be purchased inexpensively. Colors will dry matte but there are some options for glossy acrylic. Gouache is similar to watercolor and acrylic, but when mixing some colors together they can become muddled; you may have to do some experimenting. Nonetheless it will have a shiny consistency and quality. Watercolor is also water-based and can be difficult to use for inexperienced painters. Typically watercolor paintings will have an airy, fluid style to them when done well. While technically not a paint, pastels offer an oily matte look to any piece. They aren’t the easiest to blend but it is possible and they will offer a very unique texture. For oil painting I would recommend using hog hair brushes because they absorb the oils very well and are durable when cleaning the paint out. For acrylic, gouache and watercolor, I typically use synthetic hair brushes because they create clean lines without leaving hairs behind and are easy to clean afterwards; however you can use regular hair brushes if you choose to. As for brush shapes, its good to have one of each type: rounded, pointed rounded, flat, bright, filbert, angular flat, fan, and liner. It makes the biggest difference having the right brush for details and texturing. Mineral spirits and turpenoid are used to thin oil paint and clean any oil-based mistakes; however, if you want to make your oil painting glossier and fluid, you can use linseed oil. I usually mix a little bit of turpenoid and linseed oil together to create the perfect consistency in my paintings. For acrylic and gouache, I use a wooden palette because you can find a piece of wood relatively inexpensively at any hardware or art supply store. It is also easy to clean under warm water and the dried paint can be scraped off with a blade. There are plastic palettes out there that are just as good to use and are easy to clean as well. For oil paints I use a glass palette, which is very inexpensive to create. All you need is a pane of glass the size you want (mine is 11×14”) and tape the edges with duct tape or painter’s tape. Using glass makes cleaning up extremely easy by simply wiping up the excess paint or using a little bit of mineral spirits to get the dried paint off. Having a variety of sponges, rags, palette knives will immensely change how to paint! It will open so many textural doors and help you create awesome looks in any medium of painting – but there is a learning curve to each. Be sure to experiment with your tools for stylistic variance, or look up material on how your tool is typically used. 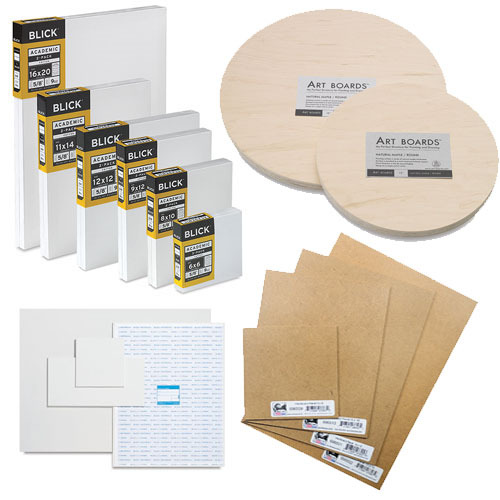 There are tons of different types and sizes of papers that can help you prep for your painting. From watercolor paper to newsprint, having a variety available will make sketching in your selected medium much easier. Keep in mind that watercolor paints will need thicker and more textured paper than would acrylics. This also applies to charcoal, pencils, colored pencils and pens. I like to have different hardness grades with pencils and charcoal. This helps by offering how light or dark of a line you want to create. Charcoal is great to have on hand for quick drawings (especially large ones), but if you are looking for something more permanent I would recommend Micron pens. They come in different sizes and are great because they do not bleed through the page. I would highly recommend having at least a table easel for painting. It allows you to sit at eye level and won’t strain your neck by looking down. If you can afford it, invest in a standing easel. It’s perfect for larger paintings and usually have a pocket where you can hold paints, brushes, tools, etc., and a small area for your palette. It is necessary in my opinion to use a varnish to protect your painting from the environment. I like to use aerosol varnish sprays but they are also available in bottle if you prefer to paint it on – don’t worry, varnishes will dry clear! They usually come in matte or glossy, I like to use glossy because it makes the textures more noticeable. Make sure to apply the varnishes after all paint is fully dried, as otherwise your painting can streak, or even worse, fall off the canvas! This is especially important for oil paint. If you have any tips of your own, please comment below!